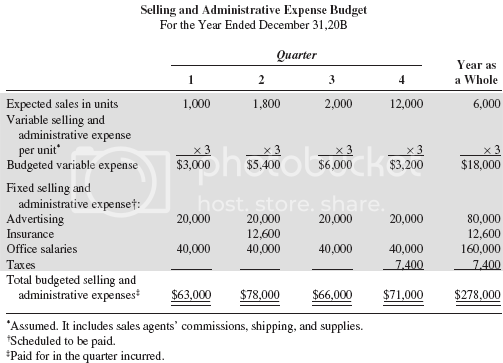 to help compute the “cost of goods sold” on the “budgeted income statement“. to give the dollar value of the “ending finished goods inventory” to appear on the “budgeted balance sheet“. Note: The “300 units” is pulled from “Production Budget – Desired Ending Inventory”. The selling and administrative expense budget lists the operating expenses involved in selling the products and in managing the business. 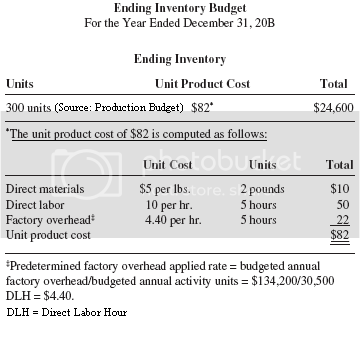 Just as in the case of the factory overhead budget, this budget can be developed using the cost-volume (flexible budget) formula in the form of y=a+bx. Note: If the number of expense items is very large, separate budgets may be needed for the selling and administrative functions.